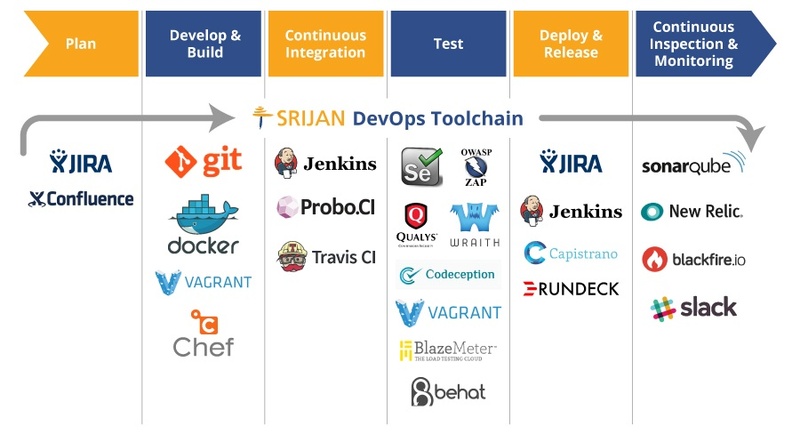 Srijan’s DevOps consulting teams can begin the engagement at any stage of your project. However, it’s best when our teams are involved right from the start, so that you can kick off with the right processes and best practices in place. The first step for our DevOps consultants is to study your existing project delivery processes. This involves understanding the build, evaluating the code base, and analyzing current QA practices. We also assess the tasks, workflows, and infrastructure that will be required to take the product live. Data gathered during the assessment phase helps us strategize and define the engineering best practices for the project. We identify the areas of the project that require automation and recommend the ideal toolchain that needs to be integrated, to speed up processes and increase productivity. Our understanding and expertise with a wide variety of tools helps us evaluate project requirements and suggest the right tools across the phases of development, CI, testing, deployment, and monitoring. Throughout the DevOps process, we use industry leading open-source and licensed tools to automate your processes and measure the performance and health of your delivery pipeline. The final step is to prioritize tasks based on project requirements and timelines. Our team prepares the roadmap for the complete project, detailing how to implement tasks and processes, taking care to keep the development and operations teams in sync at all times.